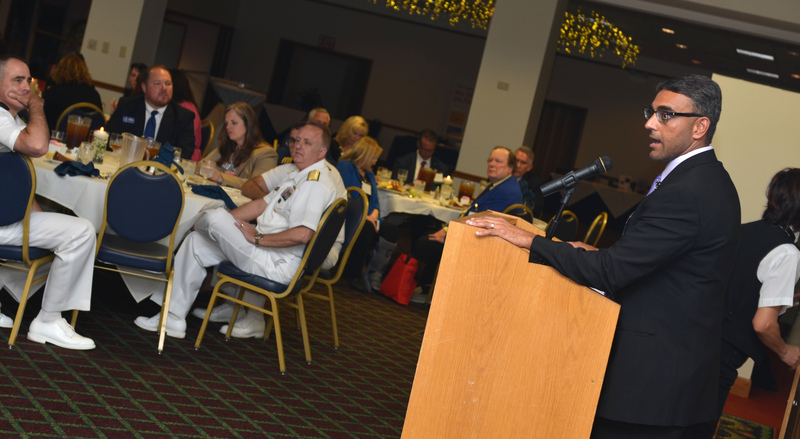 The 2019 DCMS/Navy Dinner took place at Naval Air Station Jacksonville on Tuesday, April 9. DCMS members, physicians and healthcare professionals from the Naval Hospital, and community members gathered at the Officers' Club for this annual event which serves to strengthen the collegial bond between the collective groups. This year celebrated an important theme: leadership in medicine. During the annual awards ceremony, DCMS Member Dr. F. Huson Gilberstadt received the Admiral Paul Kaufman Award which honors a local physician or healthcare professional who delivers outstanding community service to Naval Hospital beneficiaries and staff. The Circle of Excellence Award was given to Carola Miner, Naval Hospital Jacksonville's Quality Manager, for outstanding service to the medical staff at Naval Hospital Jacksonville. This year, physicians from the current and past classes of the DCMS Leadership Academy were also honored for their participation. DCMS President Dr. Ruple Galani shared some words about the annual academy, which is now in its fourth year before recognizing those in attendance who have been part of the program. Attending and receiving certificates for being part of the 2019 class were Drs. Rana Alissa and Richard Beck. Those recognized from the prior classes included Drs. Todd Endicott, Adam Jakubek, and Nicolas Moya del Pino for 2018, Drs. Catherine Hagan, Michael Kaplan, and David Volk for 2017, and Drs. Janet West and F. Huson Gilberstadt for 2016. To round out the evening, keynote speaker Rear Admiral Darin K. Via shared his experience with physicians leading healthcare delivery change. His speech, "Boardroom to Battlefield," encouraged physicians and healthcare professionals to think about new ways of leading within their offices. The DCMS wants to send a special thanks for the generous sponsors that made this event possible: Brooks Rehabilitation, St. Vincent's/Ascension, Millenium Physician Group, Coastal Spine and Pain Center, St. Johns Asset Management, and The Doctors Company.